CTV-1501 TowerVac removes cooling tower bacteria and micro-organisms without requiring cooling system shutdown or draining. Adjustable flow control can produce recovery rate of up to 60 GPM. 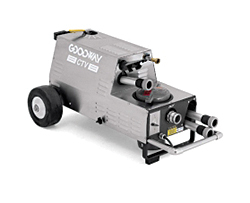 Comes with 15-foot inlet hose, 25-foot outlet hose, 24-inch wand, 36-inch extension tub and 6-inch gulper tool. Centrifugal pump, 1-1/2-HP engine.